From left, Barangay Quirino Captain Marvin Cardinez, Senior Vice President for CIP Niels Ledinek, La Union Board Member Reynaldo Mosuela, DTI Region 1 Director Daria Mingaracal, President and CEO John Stull, DTI-Bureau of Philippine Standards Director James Empeño and La Union Plant Manager Erano Santos during the inauguration of the new roller press on March 5. Leading cement maker Holcim Philippines, Inc. vowed to continue being a partner for progress of North Luzon as it celebrated with key business partners and government representatives the expansion of its plant in Bacnotan, La Union last March 5. In a message delivered by La Union Board Member Reynaldo Mosuela, Governor Francisco Emmanuel Ortega III welcomed Holcim Bacnotan’s expansion noting the company’s positive impact on the province and beyond. “Holcim has been a committed ally in effecting progress and development of La Union. As one of the biggest companies in the province, Holcim Bacnotan has consistently generated revenues that significantly contribute to the economic development of La Union. In behalf of the people of La Union, I extend my warmest congratulations and fervently pray that you continue to contribute to development cognizant of your responsibilities to the people and environment,” he said. Director James Empeño of the Department of Trade and Industry’s Bureau of Philippine Standards, noted the expansion’s relevance to the government’s “Build, Build, Build” program which requires a steady supply of quality materials. “The DTI-Bureau of Philippine Standards enjoins Holcim to continue its commitment of compliance with the requirements of the Philippine National Standards (PNS),” Director Empeño asserts. Holcim Philippines President and CEO John Stull said that the Company will continue to support North Luzon’s development by supplying cement to key infrastructures being built in the region continuing its legacy in being a partner in building several important structures in the area such as the Bangui Windmills of Ilocos Norte and San Roque Dam of Pangasinan. Stull also assured the Company’s partners that it will keep operations respectful of the environment and supportive of the community. 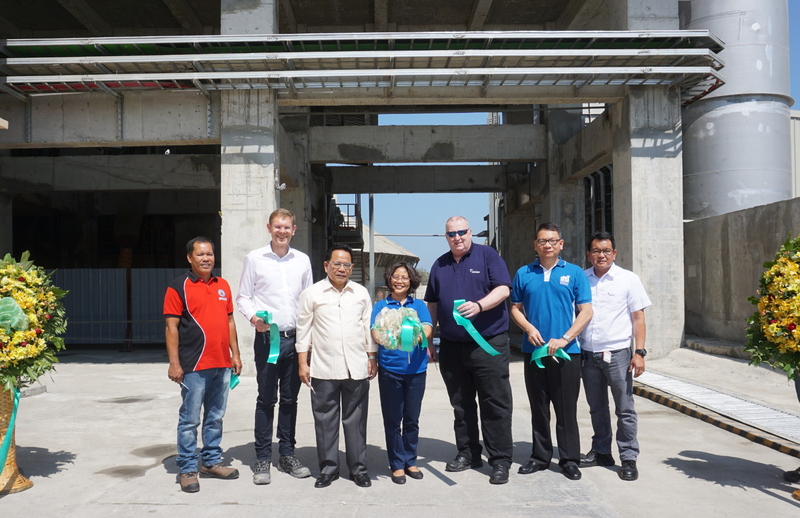 Holcim Philippines completed the installation of the new grinding equipment and storage facilities in its Bacnotan, La Union plant two months ahead of schedule in January. This increases the plant’s annual cement production capacity by 80% to around 1.8 million tons, and enables Holcim Philippines to better support the strong construction activity in North Luzon. The La Union plant upgrade is part of the first phase of Holcim Philippines’ expansion program. The second phase involves improvements to its Bulacan and Misamis Oriental plants amounting to US$ 300 million to raise the company’s annual cement production capacity by 30% to 13 million metric tons by 2020.